Earlier this year, Extreme Craft brought you the saga of The Treatment Rooms, a West London residence that is being slowly converted into a mosaic-covered piece of art. Flying eyeballs and other visionary 60's inspired images exist alongside pieces like a mosaic graffiti wall honoring an inmate (and penpal of the artist) that was executed on Texas' death row. Baroness Carrie von Reichardt and per partner Mr. Spunky have now taken on the world of art cars--a huge trend in America, but relatively new to the United Kingdom. 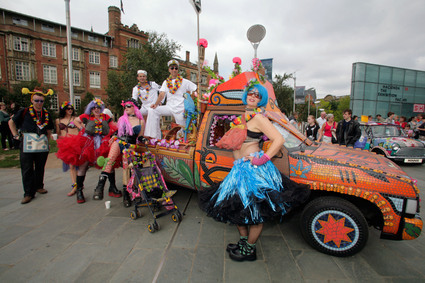 Last week, The Treatment Rooms' entry in the first-ever Manchester art car parade, Tiki Love Truck, won an award for best make-over. You can see from the photo above that their pickup truck was lovingly covered in tiki-themed mosaic tiles. The old-world craftsmanship on this truck would be entirely welcome in Detroit....or Honolulu. All I know is that I want a ride.